This 1907 postcard was an easy puzzle to solve. Check out some of the previous postcard posts and let me know which is your favorite! The front says, boldly: "EVERYBODY WORKS BUT FATHER". The father of the home sits in his rocking chair, in front of the fire, smoking his pipe, drinking his beverage, and reading his newspaper while the rest work away at the daily chores. 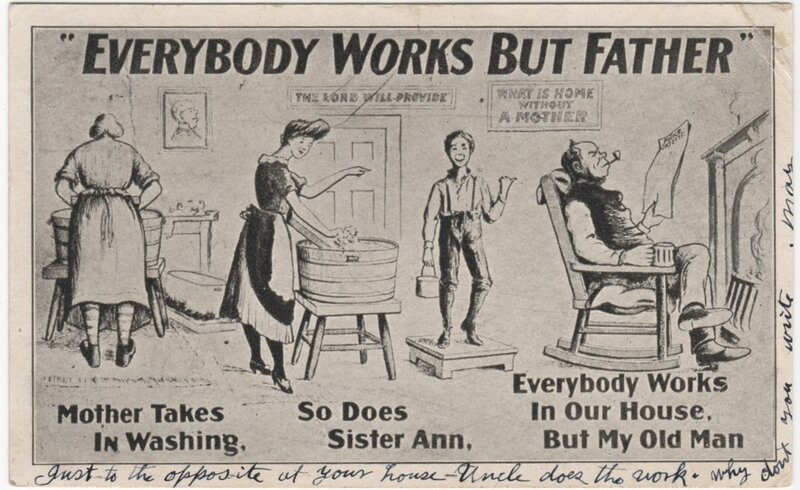 "Just to the opposite at your house - Uncle does the work. Why don't you write more"
The postcard was sent from Fostoria, Ohio to a Mrs. K.F. Way at 320 E Erie St. in Painesville, Ohio. It was sent in 1907. In the 1910 U.S. Federal Census there is indeed a Mr. and Mrs. Kilbouine Way at 320 E. Erie St. in Painesville, OH. Ella was Mrs. Way's first name. He is 71, she is 58, and they have been married for 24 years. The Find a Grave memorial for Kilbouine Fraiser Way (1839-1919) provides a lot of helpful information about his family, including Ella who was Kilbouine's 2nd wife. If you are interested in finding a story to tell there are quite a few you could explore with this family. It appears that Kilbouine was Canadian born and a veteran of the U.S. Civil War. 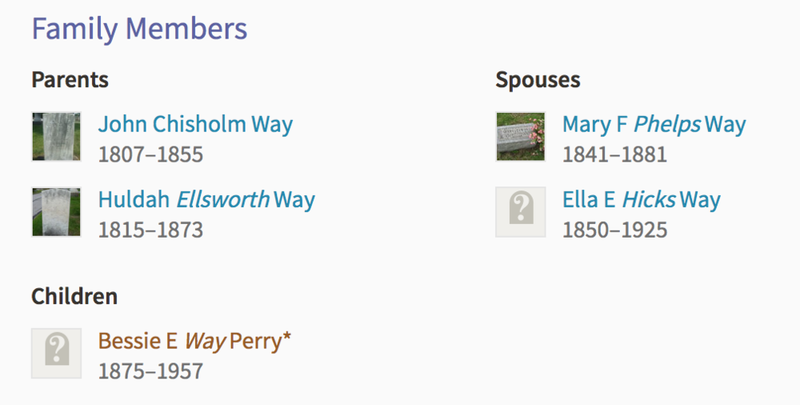 A very quick search on ancestry.com provides many hints should you chose to go down that rabbit hole. You could fill out the family tree rather quickly. If you do, please let me know because I would love to hear the story! Here are a few questions I have to guide your search. Who sent the postcard? He or she refers to Kilbouine as "Uncle" so presumably the sender is a niece or nephew. Whose side of the family? How many Canadian born men fought for the U.S. in the Civil War? It appears that Kilbouine had at least one child with his first wife. Did he have any with his second? Why did the sender chose this particular postcard to send? What does it say about the sender or the relationship he or she has to Mr. and Mrs. Way? What is the oldest piece of mail you have from your family history? Can you help be find any living relative of this couple that might be interested in having this postcard for their family archives?